The genome of higher eukaryotes contains many non-coding repetitive sequences and functional genes that are interrupted by multiple introns, this making the analysis and utilization of their genetic information extremely difficult. On the other hand, the in vitro synthesized complementary DNA copy (cDNA) of mRNA is very simple in structure, extremely rich in genetic information and therefore, highly amenable to analysis and utilization. Because of this, cDNA has been used as the central material for manipulation and utilization in genetic engineering of any fields. However, cloning of a full-length cDNA that encodes the entire amino acid sequence of the protein was exceedingly hard. 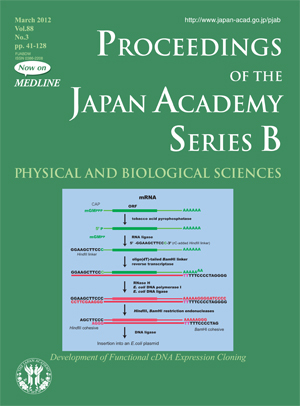 In the early 1980s, Hiroto Okayama and Paul Berg developed a new method that enables high-efficiency cloning of full-length cDNAs on the basis of their expression in a given cell of interest. 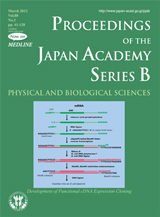 The cover illustration shows the initial ideas they conceived and tested for the development of the method reviewed in this issue.